Christian Friedel. Ernst Jacobi. Leonie Benesch. Ulrich Tukur. Ursina Lardi. Recommended. Drama. Art House. 1900-1919. Historical. Cannes Palme d'Or Winner. Rob Recommends. 01 Nigel's Choice. Religion. Murder Mystery. 1913; a strict Protestant village in northern Germany and the locals are plagued by a series of malevolences; a farmer's wife falls through rotten floorboards, a wire placed at knee-height has brought down the the doctor's horse, a window is opened exposing a newborn baby to the cold of the winter, cabbages are beheaded with a scythe, one of the Baron's sons is discovered bound and lashed by a whip, a barn is set on fire, a farmer hangs himself, a handicapped child is found tied to a tree with a message threatening divine punishment... the worried villagers are at a loss to what to do. Are we talking about the birth of the Nazi era? In some references yes, but in a more general way we are being anti-social behaviour as rooted in domestic repression. 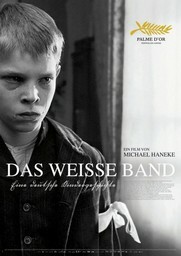 Faithful historical reconstruction gives a period authenticity, but 'Das Weisse Band' is a timeless portrait of human psychology and group behaviour. A modern masterpiece.